Timecode: Displays the time in the HH:MM:SS:FF format, where HH means hours, MM means minutes, SS means seconds and FF means frames. Frames: Displays the time in frames only. Feet + Frames: Displays the time in feet and frames. 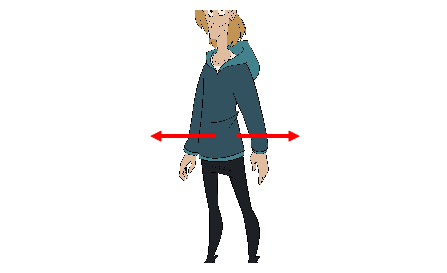 A foot corresponds to one vertical foot of animation exposure sheet, which amounts to 16 frames. 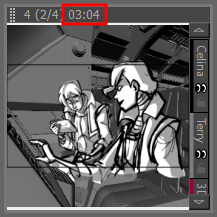 Defines the default starting time of new Storyboard Pro projects. NOTE You can change the starting time of the current project in the Project Properties dialog—see Project Properties Dialog Box. Keeps the current panel centered in the Thumbnail view. Displays the Previous and Next buttons in the Thumbnail view. When enabled, the Tools toolbar will display each tool in its own button, instead of grouping certain tools together in pop-up menus. Storyboard Pro must be relaunched to apply a change to this preference. IMPORTANT Because not all tools can be displayed simultaneously in a single column, some tools will be hidden from the Tools toolbar by default. You can customize which tools appear in the Tools toolbar by right-clicking on it and selecting Customize. 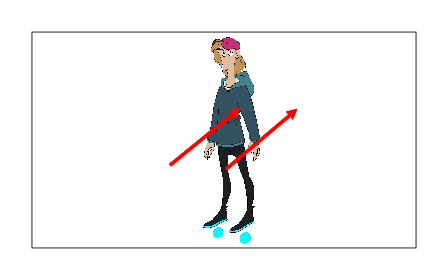 In Storyboard Pro, some keyboard shortcuts, menus or toolbar buttons are intended for specific views in your workspace. To use keyboard shortcuts or other functionalities on a specific view, this view must be focused on. 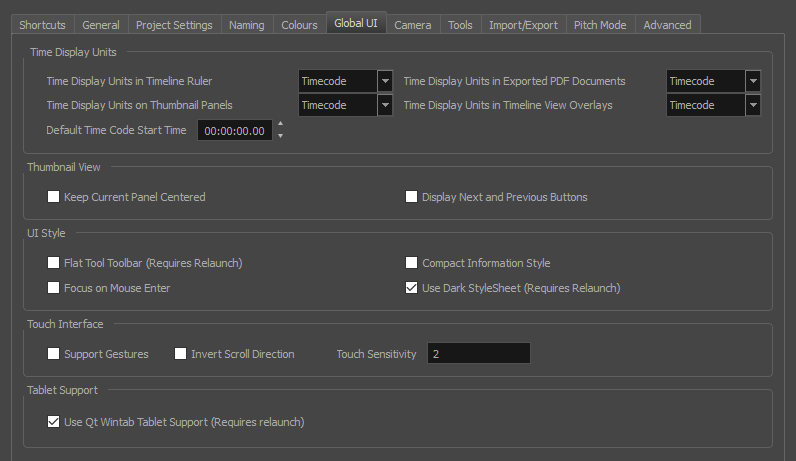 For example, the Centre on Selection shortcut will find the selected element in the Timeline or Camera view, depending on which one is focused on. 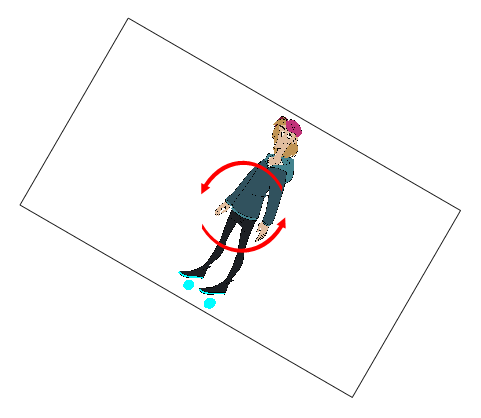 Storyboard Pro draws a red rectangle around the currently focused on view. NOTE Some items in the top menu also have functionalities that are specific to the focused on view, but moving the mouse cursor to the top menu might leave the wrong view focused on. To circumvent this problem, it might be necessary to become familiar with keyboard shortcuts, contextual (right-click) menus and the view menus available via the menu button at the top-left corner of some views. 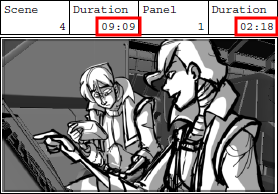 Shortens the information in the Panel, Thumbnail and Storyboard views. Application loads a dark skin for the User Interface. 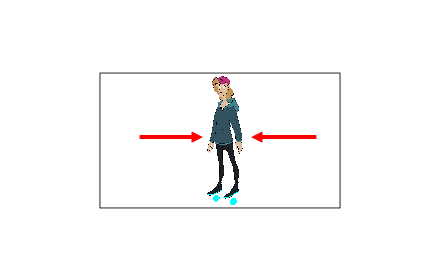 When panning a view by dragging it with your fingers in one direction, this makes the view pan in the opposite direction. Control touch sensitivity. On macOS, higher numbers give a slower response to pans. On Windows, higher numbers favour scale/rotates over pans. If you are using a tablet other than Wacom, deselect this option (and relaunch) if you are having issues with offset or pressure sensitivity.